Telekom Training conference hotel and the mobile learning working group. By invitation of Telekom Training, I went to Neuss to meet a mobile learning working group of Deutsche Telekom AG and tell them about our findings on mobile learning. 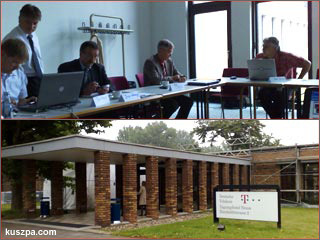 Beside people from Telekom Training, representatives of T-Mobile International and Technisch-wissenschaftliche Informatik AG (TWI AG) – the E-Learning Developer of Deutsche Telekom AG – joined the round table conference. This exchange of experiences toke place in the Telekom Training conference hotel in Neuss and it was a great opportunity for me to gain insight of the work at Deutsche Telekom AG on mobile learning.